Before we get any further, mention must be made here of the sandwiches we were equipped with at The Wainstones Hotel. In spite of the association with the name ‘Wainstones’, an outcrop I would rather forget, the Hotel deserves remembering for their superlative sarnies. The combination of Swaledale Blue Cheese and Plum Chutney, though perhaps sounding a tad unlikely, was FAB, and if I ever get another chance to have them I will. We were not to know the treat that awaited us, though, as we set off back up to Clay Top to rejoin the trail. Not for us the lift back up in the hotel car. Having said that, the morning was good, the walk through Broughton fresh and quiet, and the ascent through the woods entirely trouble free. Back at Clay top we rejoined The Cleveland Way, and so of course immediately headed up steeply until we got to the heather clad top of Urra Moor. There a broad track awaited us, winding gently along through heather which will be spectacular sometime soon when it turns purple, but is presently a rather boring grey brown green sort of thing. 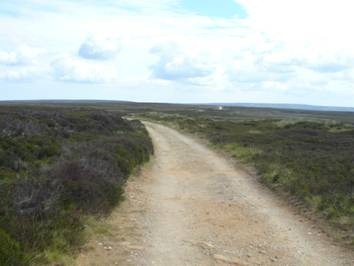 The Moors are open and empty. The walk continues along ridges with views to one side or the other, towards Middlesboro and its smoking chimneys (we do still make something in Britain then), or down into rural Farndale. We pass two ancient looking stones, one with a face the other with hands, both allegedly boundary markers. We join the track of the disused Rosedale Ironstone Railway, another ex industrial installation. At this point the skies become grey, and I decide that there is something more boring than walking through farmland. Try moors. Flat ones. 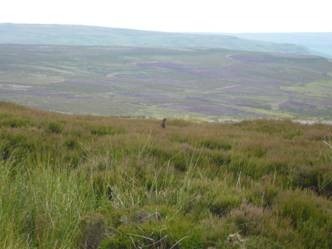 In fact I would go so far as to say that this section, either side of Blakey, was MY least pleasing section of the walk. So stick that in your pipe Wainwright. 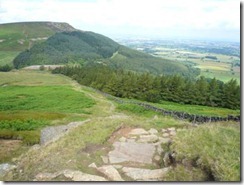 Even the Cleveland Way slunk off in disgust, to find some more ups and downs. Of course, there were one or two ameliorating instances of interest. A large signboard warning all passers-by of the dangers of the Moor. Namely, Adders lurking in the heather. Lastly Fires. Not much chance of starting one, its so damp. Cheerful then. Welcome to The North York Moors. Grice, being the plural of grouse… possibly. There are a few of them up here. Their heads stick up suddenly from the heather, singly and then a few together, where they hide unaware of the dangers pointed out by the sign board. Though I suppose, on balance, their greater danger lies in the calendar edging inexorably towards the ‘Glorious Twelfth’. The lunchtime stop involving sandwich of previous mention. A couple of Charity Walkers who overtake us like formula one walkers, as they attempt to complete the walk in some overly fast time ‘for charitee’. But really that is about it for the walking. I am therefore quite glad to see The Lion Inn on the horizon. 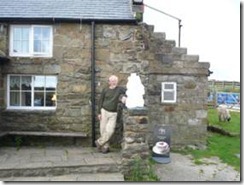 The Lion Inn Blakey. Built 1553. 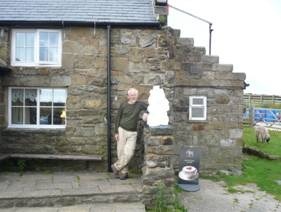 The 4th highest pub in Britain. Huge. Old dark and quirky inside. It stands on the side of a busy B road over the moors, and judging by the size of the car park, is a very popular stop indeed for day trippers. 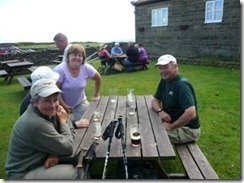 The sunshine has returned, and we are soon drinking beer with some of our fellow walkers. In our room a SHOCK awaits. A note from Mickeldore tells us that our accommodation for tomorrow night has been rearranged. No longer may we stop in The Horse Shoes in Egton Bridge, but must continue instead to Grosmont House. It is no longer ‘up to the expected standard’!!! What can have happened to The Horse Shoes? It is a topic of wonder later in the evening, as others have had their stay there cancelled too. As this will be our last evening together in the same place we all eat together. Those two from day one turn up too, and much sheep is consumed in the form of ‘Barnsley Chops’, the special of the day. 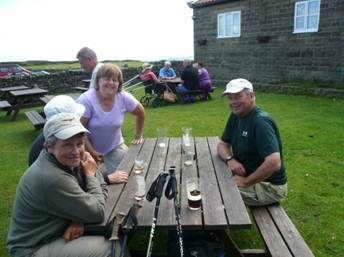 John and Trish have a mega day tomorrow as they have to go the full distance to Littlebeck (2 days for us), and so will be starting unfeasibly early.